What is Photosynthesis? How does it work? Get an insight into nature's most magnificent art with the help of flowchart! 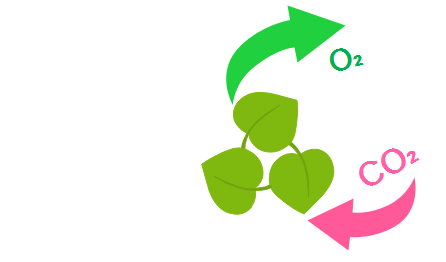 This article will introduce the process of photosynthesis, how it works, and how to draw a flowchart to represent the workflow inside the plant when photosynthesis happens. In other words, photosynthesis is the process when plants make their own food. Photosynthesis has two phases, they are commonly known as "Photosynthesis Light Reaction" and "Photosynthesis Dark Reaction". We will analyze these two phases one by one. This reaction of photosynthesis only happens when light is available. In this reaction the light hits the reaction centers of chlorophyll in the chloroplasts. The chlorophyll will vibrate, makes water molecule (H2O) and oxygen (O) released into air and the remaining molecules of hydrogen (H) from the water (H2O) remains in chloroplast and gets attached to NADP. In this phase of photosynthesis energy loses along the electron transport chain to recharge ATP from ADP. During this process, light energy gets converted into chemical energy and finally ATP molecules are produced. This reaction is also known as light-dependent reaction. This phase of photosynthesis does not require light and it takes place in stroma. In this reaction the carbon dioxide (CO2) in the atmosphere combines with hydrogen (H) from water molecules and forms glucose. During this process, ATP molecules will be converted to simple sugars. This reaction is also known as light-independent reaction. A flowchart is a way to show the steps in a process. 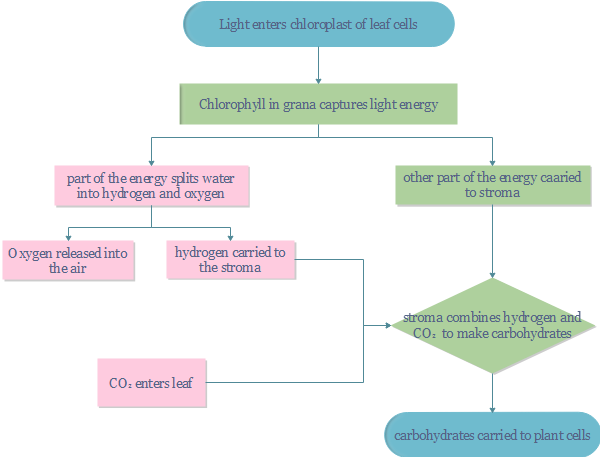 Below is the flowchart of photosynthesis process that shows the steps involved in the Light reaction and dark reaction of photosynthesis created on Edraw, a powerful flowchart software that can help draw flowcharts within a few steps. Carbon dioxide and oxygen enter and exit the plant leaves through stomata. Free download this powerful and easy-to-use flowchart and diagramming software.